Snyder Baseball Academy Bucks Elite Travel Baseball Program consists of three teams for 2018-2019; 13U, 14U and 15/16U Showcase. We have only one team in each age group. League age 14U players that are freshmen in high school are eligible to tryout for the 15/16U Showcase team. To provide a year round comprehensive program dedicated to the advancement of the serious player. The program offers an environment in which to develop the skills needed to play at the high school and college level. While the goal is to be competitive, SBA is committed to training and player development. Our staff of instructors is directly involved in the program. For this reason we only have one team in each age group. The emphasis of this program is to educate the whole person, not only in individual skill sets, but athletic values, importance of academics, nutrition, and team / leadership skills. Clearly provided rules for the codes of conduct for players and parents will be strictly enforced. SBA Bucks Tryout Form MUST be completed prior to tryouts. 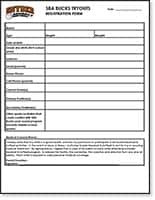 Click the link, below, to download the form to your computer, print the form and fill-in all required information. Please bring the completed form to tryouts! 13U – Anyone league age 13 for 2019 (may not be 14 prior to May 1, 2019) and rising 7th graders. A SBA staff instructor will be assigned once per week to assist in the development of certain areas during practice sessions. Nov – Speed and Agility Camp, 3 times per week (total of 8 sessions); Dec-Feb – Winter Training Program, 10 weeks (1 time per week). Players with scheduling conflicts may attend other winter programs, space permitting, in place of the winter program. All players will be strongly urged to maintain a 3.0 GPA or better. Any player failing to do so will be allowed accommodations during practice and/or game times to help concentrate on academics. While the Bucks program will not guarantee any specific amount of playing time, the goal is to prepare each and every player for middle school, high school and college baseball. Every effort will be made to ensure fair and equitable participation. Limitations on the number of positions that a player can feasibly play and level of commitment to the program may affect the amount of playing time. 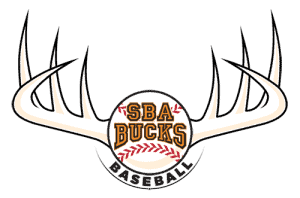 The total cost for the SBA Bucks year round program, which includes all team fees for league registration, umpires, tournament fees, paid coaches, field usage, assigned instructors, off season speed and agility and winter programs and uniforms (3 hats, 3 jerseys, 1 practice shirt) is $3250. Spirit wear will be available for purchase. Fees will be prorated for those joining in mid year. A payment plan is available to all Bucks families choosing to pay by credit card through automatic billing.